The Union has set itself the objective of maintaining and developing the Union as an area of freedom, security and justice, in which the free movement of persons is assured. To establish such an area, the Community is to adopt, among others, the measures relating to judicial cooperation in civil matters needed for the proper functioning of the internal market. The proper functioning of the internal market entails the need to improve and expedite the transmission of judicial and extrajudicial documents in civil or commercial matters for service between the Member States. The Council, by an Act dated 26 May 1997 (3), drew up a Convention on the service in the Member States of the European Union of judicial and extrajudicial documents in civil or commercial matters and recommended it for adoption by the Member States in accordance with their respective constitutional rules. That Convention has not entered into force. Continuity in the results of the negotiations for conclusion of the Convention should be ensured. On 29 May 2000 the Council adopted Regulation (EC) No 1348/2000 on the service in the Member States of judicial and extrajudicial documents in civil or commercial matters (4). The main content of that Regulation is based on the Convention. On 1 October 2004 the Commission adopted a report on the application of Regulation (EC) No 1348/2000. The report concludes that the application of Regulation (EC) No 1348/2000 has generally improved and expedited the transmission and the service of documents between Member States since its entry into force in 2001, but that nevertheless the application of certain provisions is not fully satisfactory. Efficiency and speed in judicial procedures in civil matters require that judicial and extrajudicial documents be transmitted directly and by rapid means between local bodies designated by the Member States. Member States may indicate their intention to designate only one transmitting or receiving agency or one agency to perform both functions, for a period of five years. This designation may, however, be renewed every five years. Speed in transmission warrants the use of all appropriate means, provided that certain conditions as to the legibility and reliability of the document received are observed. Security in transmission requires that the document to be transmitted be accompanied by a standard form, to be completed in the official language or one of the official languages of the place where service is to be effected, or in another language accepted by the Member State in question. This Regulation should not apply to service of a document on the party’s authorised representative in the Member State where the proceedings are taking place regardless of the place of residence of that party. The service of a document should be effected as soon as possible, and in any event within one month of receipt by the receiving agency. To secure the effectiveness of this Regulation, the possibility of refusing service of documents should be confined to exceptional situations. In order to facilitate the transmission and service of documents between Member States, the standard forms set out in the Annexes to this Regulation should be used. 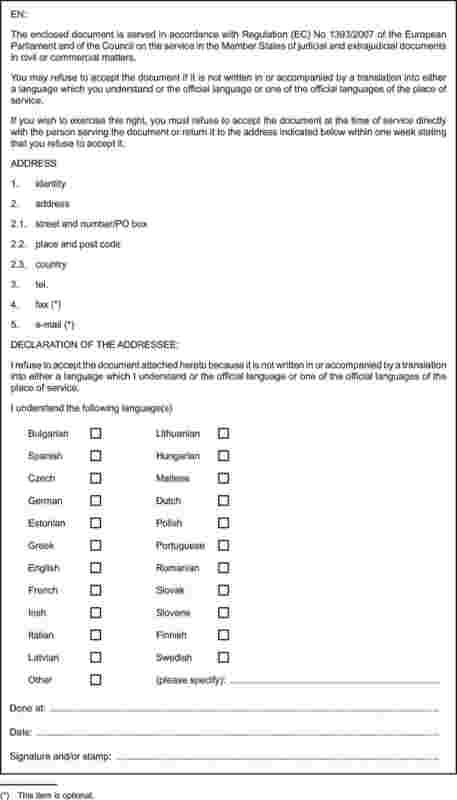 The receiving agency should inform the addressee in writing using the standard form that he may refuse to accept the document to be served at the time of service or by returning the document to the receiving agency within one week if it is not either in a language which he understands or in the official language or one of the official languages of the place of service. This rule should also apply to the subsequent service once the addressee has exercised his right of refusal. These rules on refusal should also apply to service by diplomatic or consular agents, service by postal services and direct service. It should be established that the service of the refused document can be remedied through the service on the addressee of a translation of the document. Speed in transmission warrants documents being served within days of receipt of the document. However, if service has not been effected after one month has elapsed, the receiving agency should inform the transmitting agency. 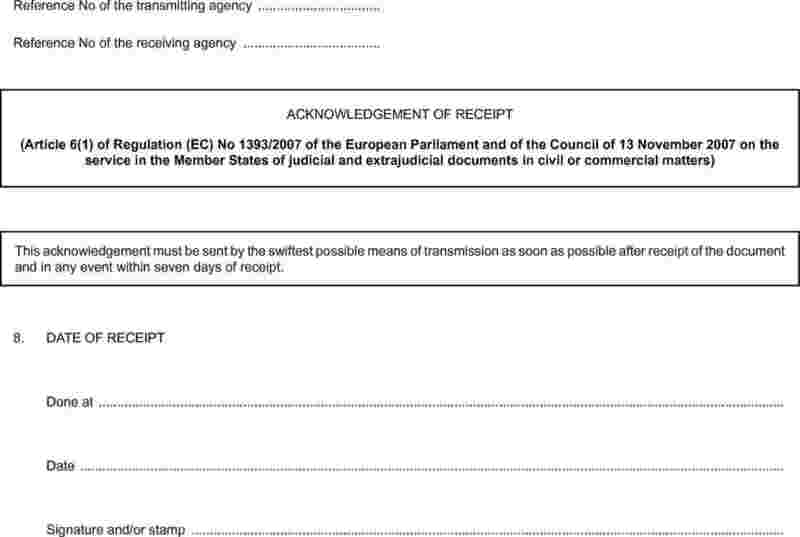 The expiry of this period should not imply that the request be returned to the transmitting agency where it is clear that service is feasible within a reasonable period. The receiving agency should continue to take all necessary steps to effect the service of the document also in cases where it has not been possible to effect service within the month, for example, because the defendant has been away from his home on holiday or away from his office on business. However, in order to avoid an open-ended obligation for the receiving agency to take steps to effect the service of a document, the transmitting agency should be able to specify a time limit in the standard form after which service is no longer required. Given the differences between the Member States as regards their rules of procedure, the material date for the purposes of service varies from one Member State to another. Having regard to such situations and the possible difficulties that may arise, this Regulation should provide for a system where it is the law of the Member State addressed which determines the date of service. However, where according to the law of a Member State a document has to be served within a particular period, the date to be taken into account with respect to the applicant should be that determined by the law of that Member State. This double date system exists only in a limited number of Member States. Those Member States which apply this system should communicate this to the Commission, which should publish the information in the Official Journal of the European Union and make it available through the European Judicial Network in Civil and Commercial Matters established by Council Decision 2001/470/EC (5). In order to facilitate access to justice, costs occasioned by recourse to a judicial officer or a person competent under the law of the Member State addressed should correspond to a single fixed fee laid down by that Member State in advance which respects the principles of proportionality and non-discrimination. The requirement of a single fixed fee should not preclude the possibility for Member States to set different fees for different types of service as long as they respect these principles. Each Member State should be free to effect service of documents directly by postal services on persons residing in another Member State by registered letter with acknowledgement of receipt or equivalent. It should be possible for any person interested in a judicial proceeding to effect service of documents directly through the judicial officers, officials or other competent persons of the Member State addressed, where such direct service is permitted under the law of that Member State. The Commission should draw up a manual containing information relevant for the proper application of this Regulation, which should be made available through the European Judicial Network in Civil and Commercial Matters. The Commission and the Member States should do their utmost to ensure that this information is up to date and complete especially as regards contact details of receiving and transmitting agencies. In calculating the periods and time limits provided for in this Regulation, Regulation (EEC, Euratom) No 1182/71 of the Council of 3 June 1971 determining the rules applicable to periods, dates and time limits (6) should apply. In particular, power should be conferred on the Commission to update or make technical amendments to the standard forms set out in the Annexes. Since those measures are of general scope and are designed to amend/delete non-essential elements of this Regulation, they must be adopted in accordance with the regulatory procedure with scrutiny provided for in Article 5a of Decision 1999/468/EC. This Regulation prevails over the provisions contained in bilateral or multilateral agreements or arrangements having the same scope, concluded by the Member States, and in particular the Protocol annexed to the Brussels Convention of 27 September 1968 (8) and the Hague Convention of 15 November 1965 (9) in relations between the Member States party thereto. This Regulation does not preclude Member States from maintaining or concluding agreements or arrangements to expedite or simplify the transmission of documents, provided that they are compatible with this Regulation. The information transmitted pursuant to this Regulation should enjoy suitable protection. This matter falls within the scope of Directive 95/46/EC of the European Parliament and of the Council of 24 October 1995 on the protection of individuals with regard to the processing of personal data and on the free movement of such data (10), and of Directive 2002/58/EC of the European Parliament and of the Council of 12 July 2002 concerning the processing of personal data and the protection of privacy in the electronic communications sector (Directive on privacy and electronic communications) (11). No later than 1 June 2011 and every five years thereafter, the Commission should review the application of this Regulation and propose such amendments as may appear necessary. Since the objectives of this Regulation cannot be sufficiently achieved by the Member States and can therefore, by reason of the scale or effects of the action, be better achieved at Community level, the Community may adopt measures, in accordance with the principle of subsidiarity as set out in Article 5 of the Treaty. In accordance with the principle of proportionality, as set out in that Article, this Regulation does not go beyond what is necessary in order to achieve those objectives. In order to make the provisions more easily accessible and readable, Regulation (EC) No 1348/2000 should be repealed and replaced by this Regulation. In accordance with Article 3 of the Protocol on the position of the United Kingdom and Ireland, annexed to the Treaty on European Union and to the Treaty establishing the European Community, the United Kingdom and Ireland are taking part in the adoption and application of this Regulation. 1. This Regulation shall apply in civil and commercial matters where a judicial or extrajudicial document has to be transmitted from one Member State to another for service there. It shall not extend in particular to revenue, customs or administrative matters or to liability of the State for actions or omissions in the exercise of state authority (acta iure imperii). 2. This Regulation shall not apply where the address of the person to be served with the document is not known. 3. In this Regulation, the term ‘Member State’ shall mean the Member States with the exception of Denmark. 1. Each Member State shall designate the public officers, authorities or other persons, hereinafter referred to as ‘transmitting agencies’, competent for the transmission of judicial or extrajudicial documents to be served in another Member State. 2. Each Member State shall designate the public officers, authorities or other persons, hereinafter referred to as ‘receiving agencies’, competent for the receipt of judicial or extrajudicial documents from another Member State. 3. A Member State may designate one transmitting agency and one receiving agency, or one agency to perform both functions. A federal State, a State in which several legal systems apply or a State with autonomous territorial units shall be free to designate more than one such agency. The designation shall have effect for a period of five years and may be renewed at five-year intervals. the languages that may be used for the completion of the standard form set out in Annex I. Member States shall notify the Commission of any subsequent modification of such information. forwarding, in exceptional cases, at the request of a transmitting agency, a request for service to the competent receiving agency. A federal State, a State in which several legal systems apply or a State with autonomous territorial units shall be free to designate more than one central body. 1. Judicial documents shall be transmitted directly and as soon as possible between the agencies designated pursuant to Article 2. 2. The transmission of documents, requests, confirmations, receipts, certificates and any other papers between transmitting agencies and receiving agencies may be carried out by any appropriate means, provided that the content of the document received is true and faithful to that of the document forwarded and that all information in it is easily legible. 3. The document to be transmitted shall be accompanied by a request drawn up using the standard form set out in Annex I. 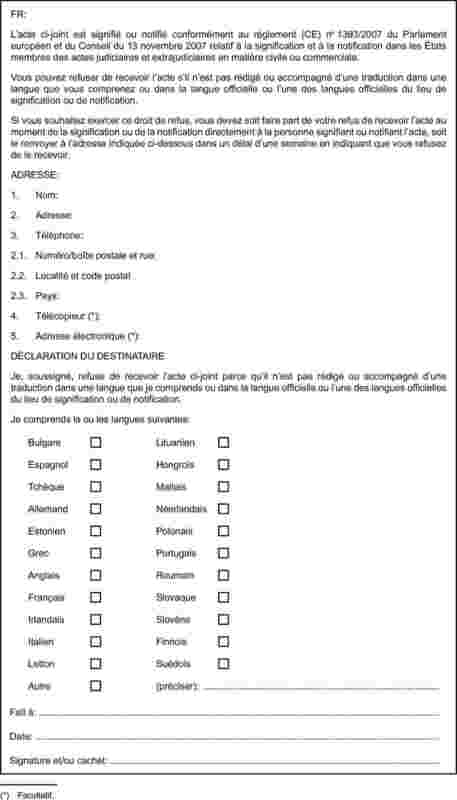 The form shall be completed in the official language of the Member State addressed or, if there are several official languages in that Member State, the official language or one of the official languages of the place where service is to be effected, or in another language which that Member State has indicated it can accept. 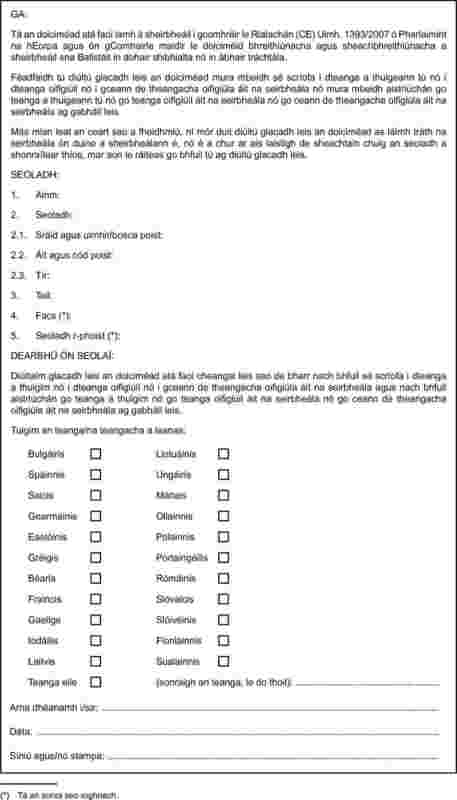 Each Member State shall indicate the official language or languages of the institutions of the European Union other than its own which is or are acceptable to it for completion of the form. 4. The documents and all papers that are transmitted shall be exempted from legalisation or any equivalent formality. 5. When the transmitting agency wishes a copy of the document to be returned together with the certificate referred to in Article 10, it shall send the document in duplicate. 1. 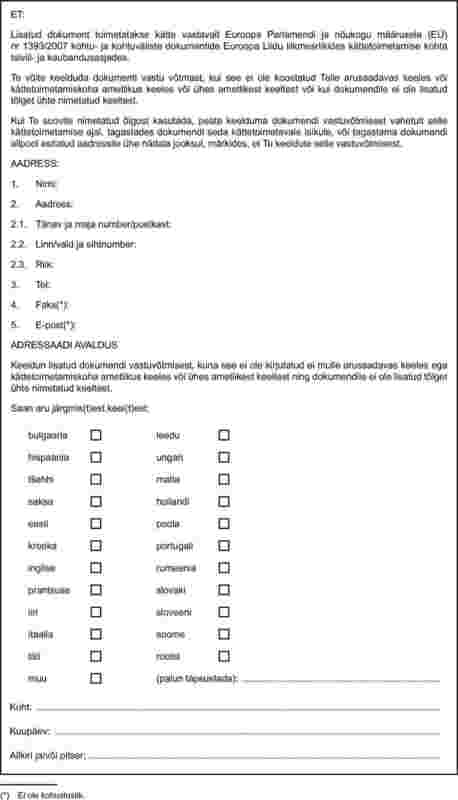 The applicant shall be advised by the transmitting agency to which he forwards the document for transmission that the addressee may refuse to accept it if it is not in one of the languages provided for in Article 8. 2. The applicant shall bear any costs of translation prior to the transmission of the document, without prejudice to any possible subsequent decision by the court or competent authority on liability for such costs. 1. On receipt of a document, a receiving agency shall, as soon as possible and in any event within seven days of receipt, send a receipt to the transmitting agency by the swiftest possible means of transmission using the standard form set out in Annex I. 2. Where the request for service cannot be fulfilled on the basis of the information or documents transmitted, the receiving agency shall contact the transmitting agency by the swiftest possible means in order to secure the missing information or documents. 3. 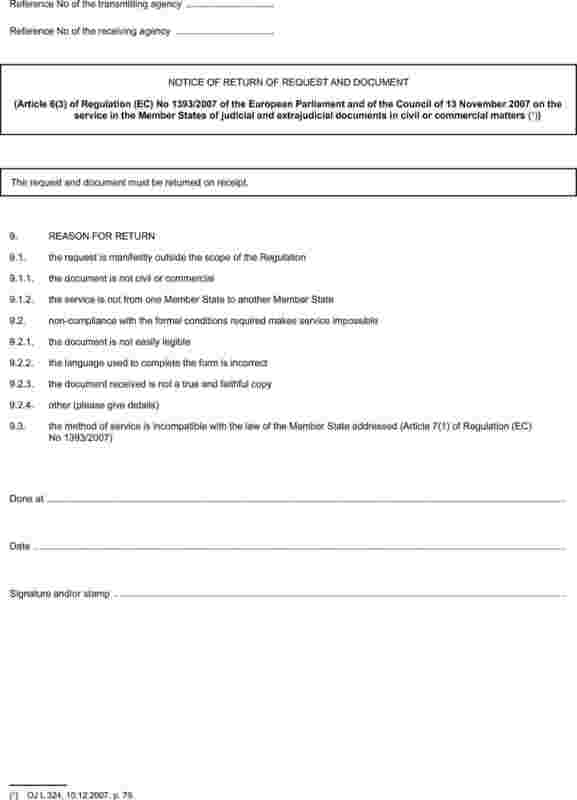 If the request for service is manifestly outside the scope of this Regulation or if non-compliance with the formal conditions required makes service impossible, the request and the documents transmitted shall be returned, on receipt, to the transmitting agency, together with the notice of return using the standard form set out in Annex I. 4. 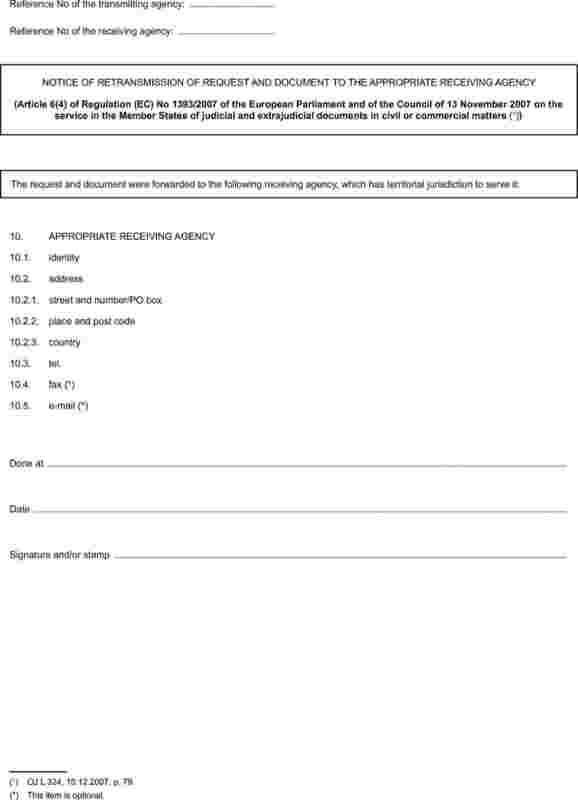 A receiving agency receiving a document for service but not having territorial jurisdiction to serve it shall forward it, as well as the request, to the receiving agency having territorial jurisdiction in the same Member State if the request complies with the conditions laid down in Article 4(3) and shall inform the transmitting agency accordingly using the standard form set out in Annex I. 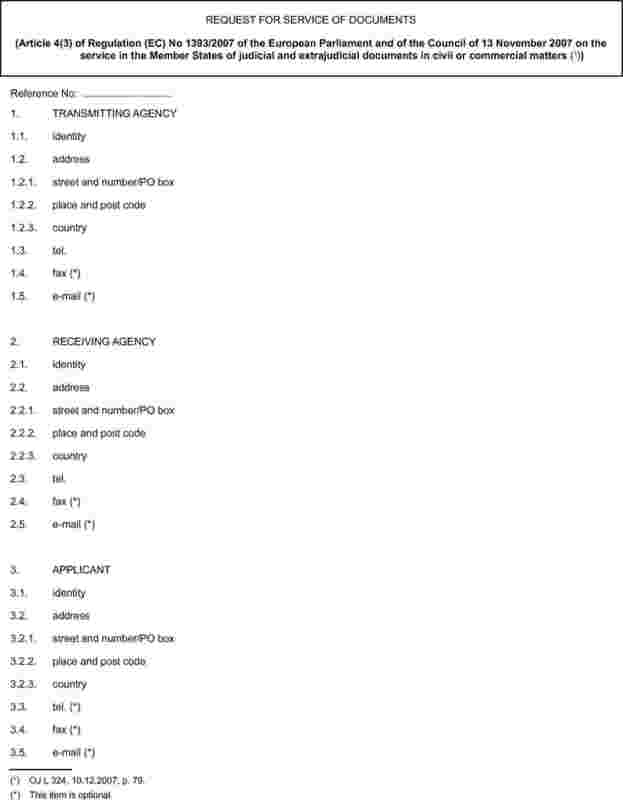 That receiving agency shall inform the transmitting agency when it receives the document, in the manner provided for in paragraph 1. 1. The receiving agency shall itself serve the document or have it served, either in accordance with the law of the Member State addressed or by a particular method requested by the transmitting agency, unless that method is incompatible with the law of that Member State. continue to take all necessary steps to effect the service of the document, unless indicated otherwise by the transmitting agency, where service seems to be possible within a reasonable period of time. the official language of the Member State addressed or, if there are several official languages in that Member State, the official language or one of the official languages of the place where service is to be effected. 3. 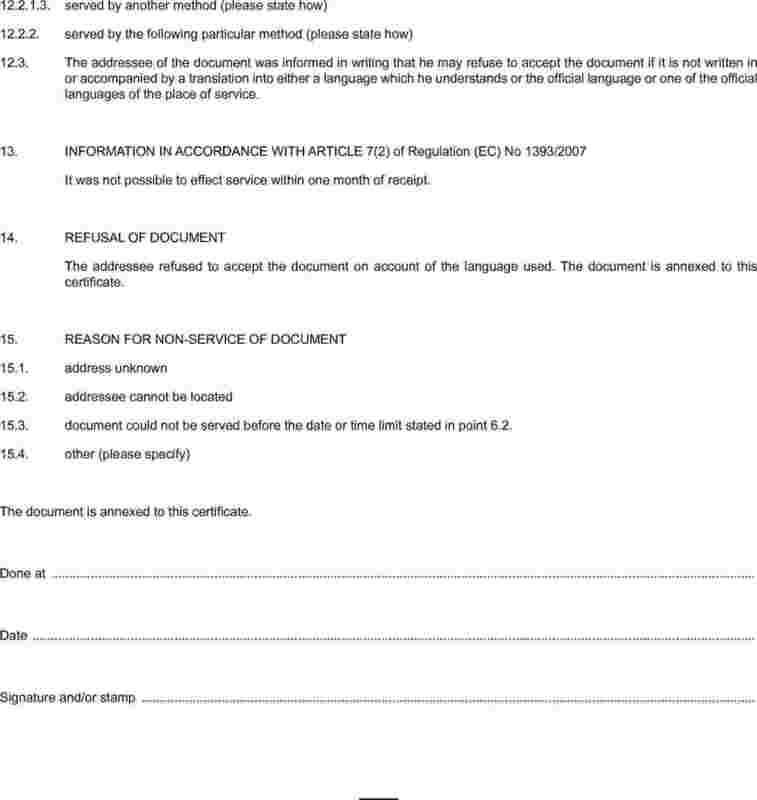 If the addressee has refused to accept the document pursuant to paragraph 1, the service of the document can be remedied through the service on the addressee in accordance with the provisions of this Regulation of the document accompanied by a translation into a language provided for in paragraph 1. 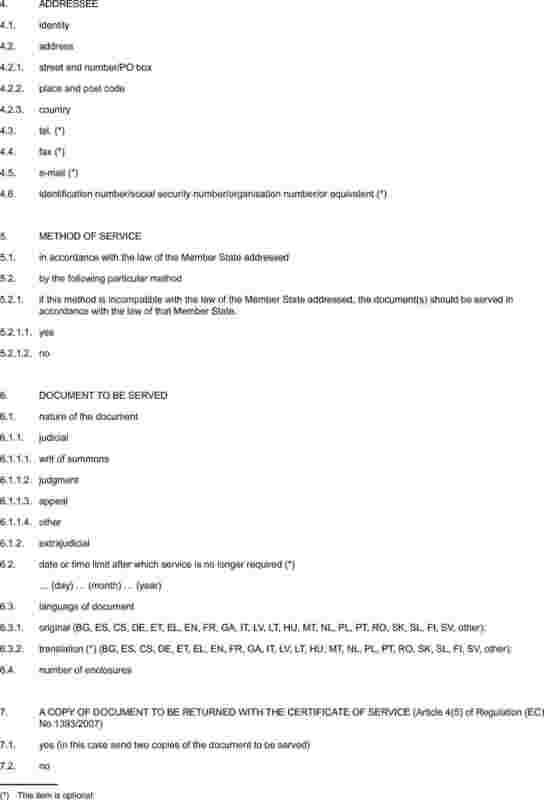 In that case, the date of service of the document shall be the date on which the document accompanied by the translation is served in accordance with the law of the Member State addressed. However, where according to the law of a Member State, a document has to be served within a particular period, the date to be taken into account with respect to the applicant shall be the date of the service of the initial document determined pursuant to Article 9(2). 5. 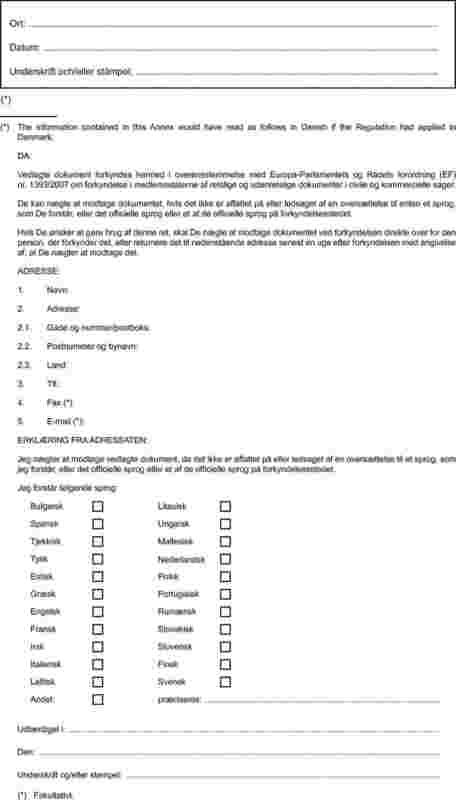 For the purposes of paragraph 1, the diplomatic or consular agents, where service is effected in accordance with Article 13, or the authority or person, where service is effected in accordance with Article 14, shall inform the addressee that he may refuse to accept the document and that any document refused must be sent to those agents or to that authority or person respectively. 1. Without prejudice to Article 8, the date of service of a document pursuant to Article 7 shall be the date on which it is served in accordance with the law of the Member State addressed. 2. However, where according to the law of a Member State a document has to be served within a particular period, the date to be taken into account with respect to the applicant shall be that determined by the law of that Member State. 3. Paragraphs 1 and 2 shall also apply to the means of transmission and service of judicial documents provided for in Section 2. 1. 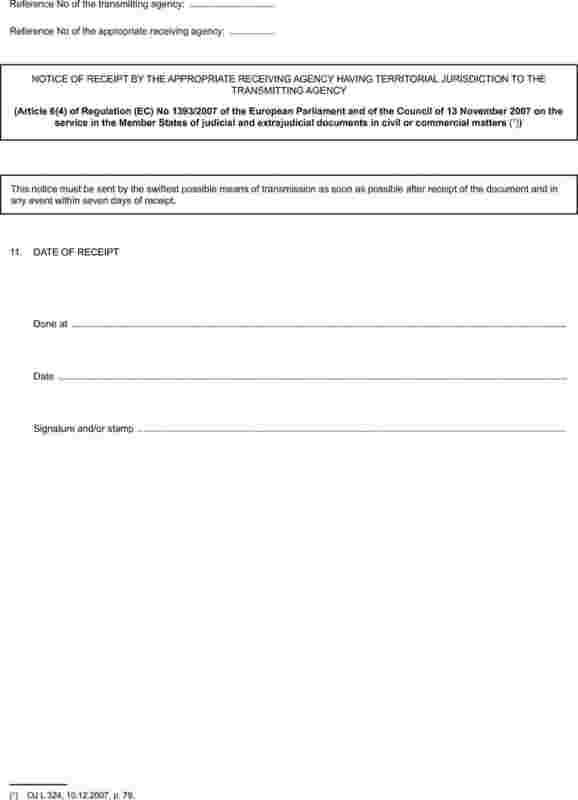 When the formalities concerning the service of the document have been completed, a certificate of completion of those formalities shall be drawn up in the standard form set out in Annex I and addressed to the transmitting agency, together with, where Article 4(5) applies, a copy of the document served. 2. 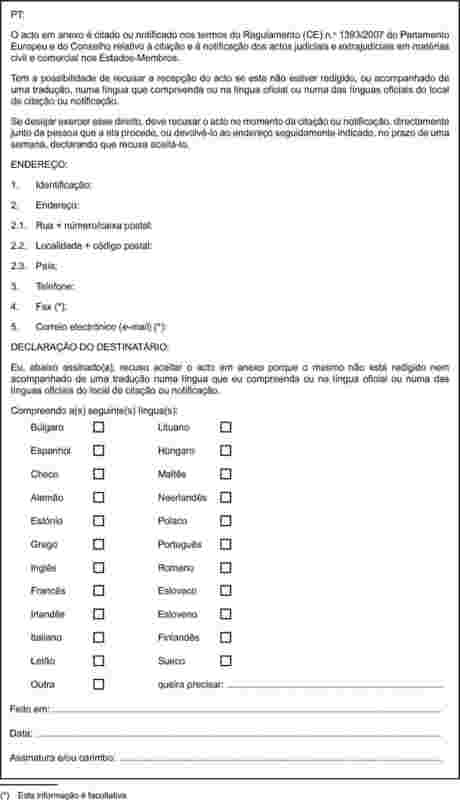 The certificate shall be completed in the official language or one of the official languages of the Member State of origin or in another language which the Member State of origin has indicated that it can accept. 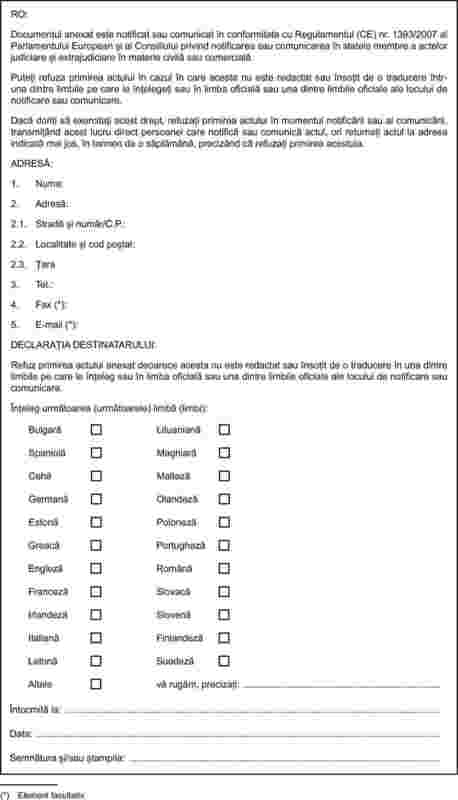 Each Member State shall indicate the official language or languages of the institutions of the European Union other than its own which is or are acceptable to it for completion of the form. 1. The service of judicial documents coming from a Member State shall not give rise to any payment or reimbursement of taxes or costs for services rendered by the Member State addressed. the use of a particular method of service. Costs occasioned by recourse to a judicial officer or to a person competent under the law of the Member State addressed shall correspond to a single fixed fee laid down by that Member State in advance which respects the principles of proportionality and non-discrimination. Member States shall communicate such fixed fees to the Commission. Each Member State shall be free, in exceptional circumstances, to use consular or diplomatic channels to forward judicial documents, for the purpose of service, to those agencies of another Member State which are designated pursuant to Articles 2 or 3. 1. Each Member State shall be free to effect service of judicial documents on persons residing in another Member State, without application of any compulsion, directly through its diplomatic or consular agents. 2. Any Member State may make it known, in accordance with Article 23(1), that it is opposed to such service within its territory, unless the documents are to be served on nationals of the Member State in which the documents originate. Each Member State shall be free to effect service of judicial documents directly by postal services on persons residing in another Member State by registered letter with acknowledgement of receipt or equivalent. Any person interested in a judicial proceeding may effect service of judicial documents directly through the judicial officers, officials or other competent persons of the Member State addressed, where such direct service is permitted under the law of that Member State. Extrajudicial documents may be transmitted for service in another Member State in accordance with the provisions of this Regulation. Measures designed to amend non-essential elements of this Regulation relating to the updating or to the making of technical amendments to the standard forms set out in Annexes I and II shall be adopted in accordance with the regulatory procedure with scrutiny referred to in Article 18(2). 5. Paragraph 4 shall not apply to judgments concerning the status or capacity of persons. 1. This Regulation shall, in relation to matters to which it applies, prevail over other provisions contained in bilateral or multilateral agreements or arrangements concluded by the Member States, and in particular Article IV of the Protocol to the Brussels Convention of 1968 and the Hague Convention of 15 November 1965. 2. This Regulation shall not preclude individual Member States from maintaining or concluding agreements or arrangements to expedite further or simplify the transmission of documents, provided that they are compatible with this Regulation. any denunciation of, or amendments to, these agreements or arrangements. This Regulation shall not affect the application of Article 23 of the Convention on civil procedure of 17 July 1905, Article 24 of the Convention on civil procedure of 1 March 1954 or Article 13 of the Convention on international access to justice of 25 October 1980 between the Member States party to those Conventions. 1. Information, including in particular personal data, transmitted under this Regulation shall be used by the receiving agency only for the purpose for which it was transmitted. 2. Receiving agencies shall ensure the confidentiality of such information, in accordance with their national law. 3. Paragraphs 1 and 2 shall not affect national laws enabling data subjects to be informed of the use made of information transmitted under this Regulation. 4. This Regulation shall be without prejudice to Directives 95/46/EC and 2002/58/EC. 1. Member States shall communicate to the Commission the information referred to in Articles 2, 3, 4, 10, 11, 13, 15 and 19. Member States shall communicate to the Commission if, according to their law, a document has to be served within a particular period as referred to in Articles 8(3) and 9(2). 2. 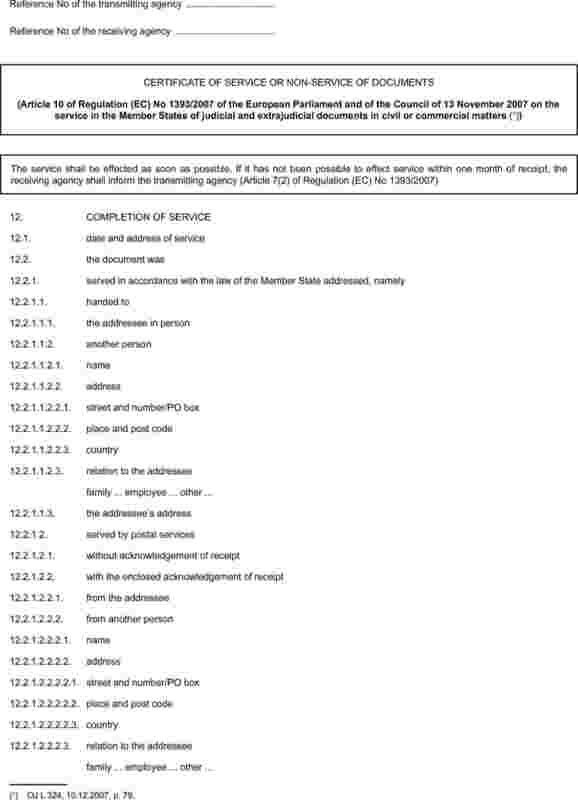 The Commission shall publish the information communicated in accordance with paragraph 1 in the Official Journal of the European Union with the exception of the addresses and other contact details of the agencies and of the central bodies and the geographical areas in which they have jurisdiction. 3. The Commission shall draw up and update regularly a manual containing the information referred to in paragraph 1, which shall be available electronically, in particular through the European Judicial Network in Civil and Commercial Matters. No later than 1 June 2011, and every five years thereafter, the Commission shall present to the European Parliament, the Council and the European Economic and Social Committee a report on the application of this Regulation, paying special attention to the effectiveness of the agencies designated pursuant to Article 2 and to the practical application of Article 3(c) and Article 9. The report shall be accompanied if need be by proposals for adaptations of this Regulation in line with the evolution of notification systems. 1. Regulation (EC) No 1348/2000 shall be repealed as from the date of application of this Regulation. 2. References made to the repealed Regulation shall be construed as being made to this Regulation and should be read in accordance with the correlation table in Annex III. It shall apply from 13 November 2008 with the exception of Article 23 which shall apply from 13 August 2008. (1) OJ C 88, 11.4.2006, p. 7. (2) Opinion of the European Parliament of 4 July 2006 (OJ C 303 E, 13.12.2006, p. 69), Council Common Position of 28 June 2007 (OJ C 193 E, 21.8.2007, p. 13) and Position of the European Parliament of 24 October 2007. (3) OJ C 261, 27.8.1997, p. 1. On the same day as the Convention was drawn up the Council took note of the explanatory report on the Convention which is set out on page 26 of the aforementioned Official Journal. (4) OJ L 160, 30.6.2000, p. 37. (5) OJ L 174, 27.6.2001, p. 25. (6) OJ L 124, 8.6.1971, p. 1. (8) Brussels Convention of 27 September 1968 on Jurisdiction and the Enforcement of Judgments in Civil and Commercial Matters (OJ L 299, 31.12.1972, p. 32; consolidated version, OJ C 27, 26.1.1998, p. 1). (9) Hague Convention of 15 November 1965 on the Service Abroad of Judicial and Extrajudicial Documents in Civil or Commercial Matters. (10) OJ L 281, 23.11.1995, p. 31. Directive as amended by Regulation (EC) No 1882/2003 (OJ L 284, 31.10.2003, p. 1). (11) OJ L 201, 31.7.2002, p. 37. Directive as amended by Directive 2006/24/EC (OJ L 105, 13.4.2006, p. 54).